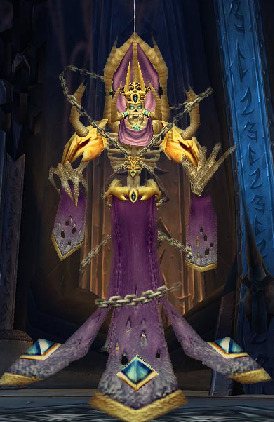 Valithria is an interesting encounter in Icecrown Citadel and undoubtedly, one that will quickly become a favourite of your healing team. As a shaman, you may find yourself asked to heal during this fight. 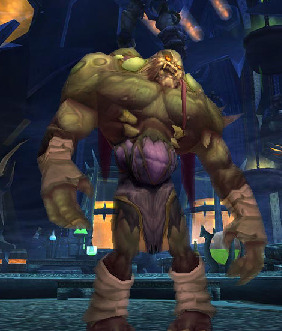 For us, as an example, we run with three main spec healers (one of whom respecs for some two healer fights). 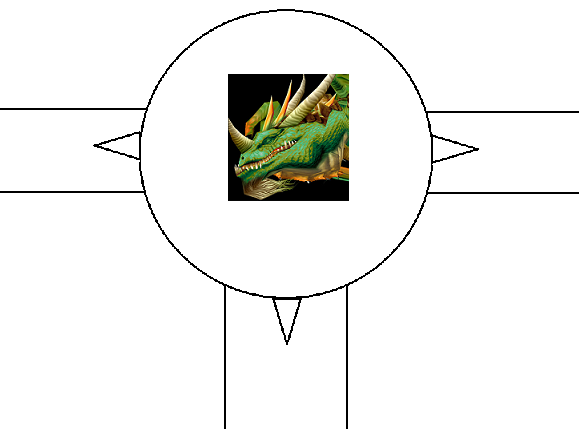 The DPS requirements of Valithria are not high so we prefer to utilise four healers. The fourth? You guessed it; the elemental shaman. The idea of the encounter is very simple. You have to heal Valithria back to full health while dealing with several waves of adds that spawn. These adds will either try to kill your raid or to harm Valithria herself. As the fight progresses, the waves come faster but the mechanics of the encounter do not change. In this guide, I’ll talk you through the basics of both healing or DPSing this encounter for the main spec elemental shamans out there. The above screenshot shows Valithria’s room. As with most of our tactics, we use the floor markings as an indication of where our raid should be positioned. You will find four Risen Archmages channelling on Valithria. To begin the encounter, these must be engaged and killed. We use one tank for this encounter and as such, agro can be trying. Our paladin tank stays in the central area as shown as for the most part, we let the mobs come to him. This is somewhat dependent upon the adds and I’ll detail these in the next section. Essentially, there are six different types of adds that will spawn and rush either your raid or Valithria. They have different abilities of their own and as such, have a different kill order priority. The lay waste ability is nasty as not only will it hit all members of your raid, but it will hit Valithria too. 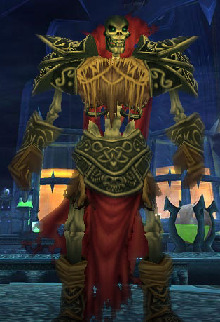 Due to this ability, the blazing skeletons are the DPS priority. We have one or two melee take these adds as their kill priority. They have low hit points and can easily be dealt with by a couple of melee. A frosty coloured circle will be marked on the ground. Two seconds later, a frost spike will erupt and throw any raid members stood on it, into the air. It’s completely avoidable, however. Should this be allowed to cast, it will hit all members of your raid for frost damage along with slowing them. It can and should be interrupted however. This places a purple void zone on the ground, draining the mana of anyone standing in it. The screenshot above captures both a column of frost and a mana void. Whenever the zombie lands a melee swing, the target will take around 2k nature damage every three seconds and suffer an armour debuff of 10%. This can stack to 5 and is particularly nasty on your tanks as the waves come faster later in the fight. Much as it sounds, these zombies explode on death dealing nature damage to all around them and applying a nature based DoT. While these have a fair amount of hit points, they have the weakest abilities. This deals 2000 nature damage per second and increases physical damage taken by 25% for 12 seconds. As the abomination dies, it spawns approximately 7 rot worms. These can be AoE’d down. There is no doubt that the blazing skeletons should die first and these will undoubtedly be your primary DPS target when alive. 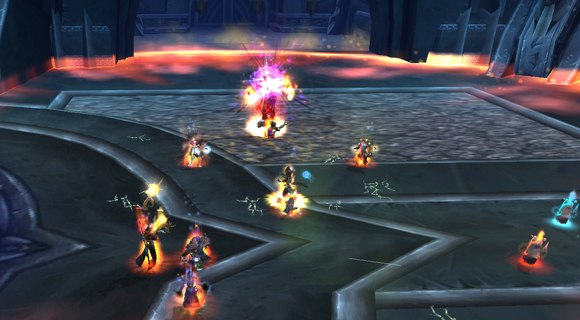 Whether your second priority is the arch mage or the zombies may depend on your raid setup. The best tactic for the zombies is to kite them and have all your ranged DPS burn them down. 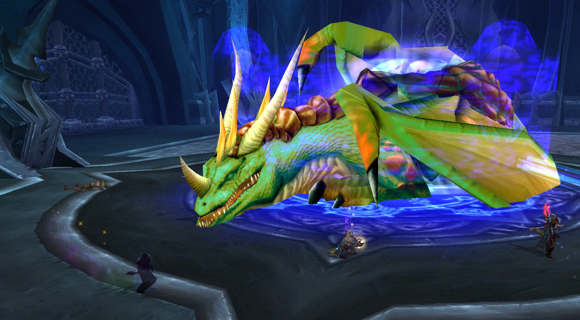 However, it’s imperative that the arch mage has his frost bolt volley interrupted also. 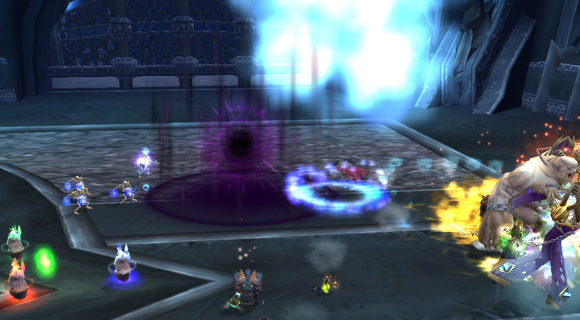 For us, we have one melee (our enhancement shaman), switch to the arch mage instantly and interrupt the volley. This leaves me comfortably burning the zombies with the other ranged DPS. Should you be low on interrupts (or have slack melee that fail at them), it may be better for you to focus on the interrupts as soon as the arch mage spawns. Regarding the suppressors – these need to die promptly due to their channelled spell. We run quite melee heavy and they are dispatched very quickly by our melees. With different setups, you might need to be switching to these earlier and certainly before the abominations (as these are generally quite easy to deal with). In this sense, you will need to be quite flexible in what you’re DPSing and setting priorities based upon your own raid setup. The waves of adds will continue in this way until Valithria is healed to 100%. Remember, the speed at which they come does increase over time. There are two potential roles you maybe asked to fill on this fight. 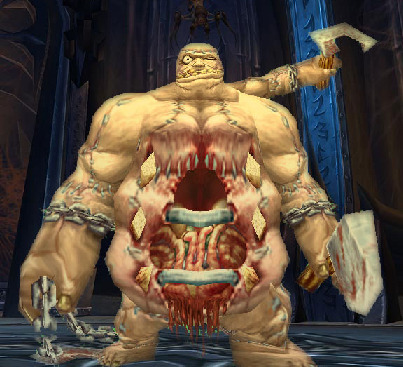 The first is to focus on Valithria and enter the dream state when the nightmare portals spawn. The second is to stay outside, healing both the raid and Valithria. The most likely role if you are not a main spec healer, is to enter the dream state. These are summoned by Valithria and on ten man mode, two healers will be entering the dream state. Periodically, you will see green portals (red on heroic) spawn around her. Clicking on these will port you to the “dream state”. This is a version of Valithria’s room occupied only by dream clouds. These are bright green clouds floating around her room. Some guilds have their healers stack together in the dream state and multiple players can be affected by the buff from the same dream cloud. We don’t do this. We have one healer take the right hand side and one take the left hand side. This ensures that they have more than enough dream clouds to stack the buff high. This buff mechanic is what allows you to heal Valithria back to full health. If you are assigned to heal Valithria, then you can start the fight by casting Earth Shield on her. If you’re using the glyph of lesser healing wave this will allow your Lesser Healing Waves to heal for more. 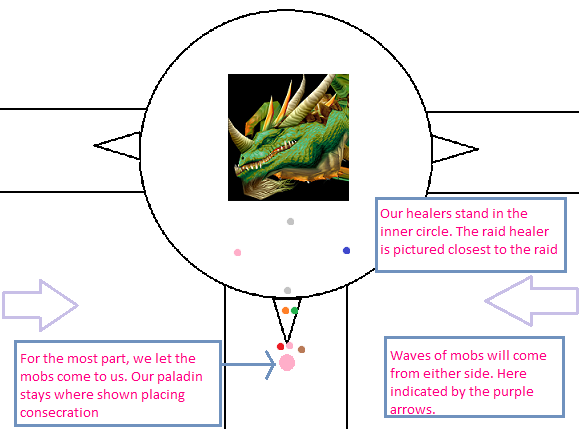 How you initially heal her (prior to the nightmare portals) maybe somewhat dependent upon your gear. I use a combination of Riptide every time it is off cooldown and Healing Wave. Be warned however, while healing wave heals for considerably more it will burn through your mana and if you have poor restoration gear, you may wish to consider sticking to Lesser Healing Wave until you have the buff from the dream state. When the portals spawn, jump in as soon as you can. Your aim in here is very simple. Fly into as many clouds as possible (they will vanish if you have “hit” them correctly). Each time you do so, you’ll gain one stack of emerald vigor. You want to stack this as high as possible before you automatically get ported back into her room. The clouds have a very fast respawn so you won’t run the risk of running out of them. Be aware that because you’re flying and as you have to be close to the clouds to activate them, perception can be difficult in here. You will gain access to the dream state for 15 seconds a time before you are ported back to Valithria’s room. Upon being ported back, commence healing her. If you were initially using lesser healing wave, you should now switch to healing wave as the mana regeneration gained from emerald vigor should stop you from running out of mana. Valithria is a fun and relatively straight forward encounter. She can, however, be a little intimidating for the elemental shamans out there who are asked to heal. Never the less, once you have gotten used to activating the clouds in the dream state and keeping up your buff, you’ll find this encounter easy. Be aware that Valithria can’t be healed by spells that have a group or raid wide mechanic. For shaman’s this includes chain heal so stick to your single target heals. Start with lesser healing wave if necessary and switch to healing wave once you have the buff. I have heard of people using resistance totems on Valithria, so be prepared to do so if asked. We don’t find this necessary on either normal or heroic mode however. You can use your normal totem setup. This is best used when both healers have a good stack of the buffs (so towards the end of the fight). Obviously, to make the most of it, you want to be popping it just as you exit the dream state. If you’re DPSing it, keep your wind sheer and frost shock close at hand for interrupting the archmage and for slowing the zombies. Chain lightning can be very useful on the suppressors, though these are generally dealt with by your melee. If you use a positioning similar to us, magma totem can be used to full effect (though wading in and out to place the totem down can become extremely annoying.) I use either totem of wrath or searing totem and, when placed centrally with the tank, fire nova can be used for the rot worms. As I mentioned above, I have heard of guilds using resistance totems on this fight though we don’t. Heroism should be timed to be of best use to both the healers and the DPS outside. As the fight progresses, you get increasing amounts of adds and popping heroism can be a way to catch up. You must ensure that the healers also benefit from this; they should have just exited the portal when it is used. Make sure there is good communication between yourself and the healers in regards to timing your heroism.